With design emerging as a dynamic sector in India today, the India Design Report released by CII captures critical developments across several design disciplines at 15th CII-NID Design Summit held on 2-3 December, 2015 at New Delhi. India Design Report is endorsed by India Design Council. Confederation of Indian Industry (CII), has been promoting design as a critical business activity for over 15 years, through its National Committee on Design. The India Design Report is the only publication of its kind – a comprehensive document examining all aspects of the design industry, including design policy, design education, evolution of all the various design disciplines and views from industry. 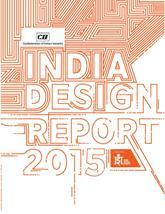 “CII Design Report 2015” is a national survey to understand the Design Industry in India and to report the findings. # 1. Analyze the current state of design in different design disciplines. # 3. Guide effective policy and program development. # 4. Inform various stakeholders like industries, governments, and public about the strengths and activities of Indian design. # 5. Presents statistics of Indian design, information about design governance, design ecology, applicability of design and some trends.